Hello, this is EBRose checking in! I am a 21years young female who is currently a resident of Sydney. I confess I've been lurking around the steampunk community for a while now, looking in the incorrect locations for steampunk events of the antipodean vicinity. I take part as a lapidary enthusiast and enjoy playing with rocks and metal. I look forward to meeting some fascinating characters and hope to make some good acquaintances! Curses, I thought I'd posted here. I'm Professor von Explaino, lecturer in omniology, and one of the founders of the R.O.S.E.A Brisbane steampunk group. In crew we've attended numerous Supernovas and participated in the MS Walk and Brisbane Romp charity events. We've a number of builders, fashion-talents, artisans and general tinkerers and we're always happy to meet new Steampunkers in our area. There's a loose alliance with F.A.U.S.T in Brisbane called S.T.E.A.M. I've only recently discovered Steampunk but it's the perfect blend of many interests of mine and I feel at home with it overall. I've always loved stories with such themes and I'm looking forward to participating in local activities. I'm 45, female and live in country Victoria. I am Augur, from Auckland, New Zealand. Please do see my formal introduction on Brass Goggles for more information. I'm involved in the fledgling Auckland steampunk scene, and was present at Aether & Iron 2011 at MOTAT. I'm a member of Tangleball, a community workshop, makerspace, hackerspace, where I'm getting into creating collaborative steampunk projects, and running steampunk workshops with guest presenters. I'm also attending nzLARPS upcoming steampunk LARP game "The Great Exhibition", which is being held at MOTAT tomorrow. I'm really looking forward to this! It will be my first LARP. Post licensed under Creative Commons Attribution-NonCommercial-ShareAlike 3.0 New Zealand. Please quote this post with proper attribution. Rollcall? Right - On parade, sah! Yes, everybody assumes the B. is short for B----y, and some days perhaps it should be, but me dear ol' mum didn't use such words, let alone to name her pride and joy all those years ago. The choice of moniker is rather obvious, but I like such wordplay and it seems to fit me well. Especially when one can choose to introduce oneself purely by surname on occasion, or use the full name in that 'Bond, James Bond'-style with emphasis on the middle Initial as "B----" when it seems most apt. I should get some cards printed up, 2 models, one with the full verion, the other blank except for 'Strange'. Ancient pre-nerd from the era when hacking meant illicit logging into mainframes, and playing 'science-lab' meant nitrating glycerine in the shed from old textbooks, random redneck gun shooter, and recreational dynamite-angler (now it's all called jihad-training, back then they were just rural hobbies) somehow I survived long enough to be bored doing a B.Sci at uni and found myself taking the Queen's shilling instead. Now I manage to play the same crazy games all for pay, plus occasionally I dress up in archaic militaria, funny hats, and lots of shiny bits and brass - and that's work too, not just relaxing around here. Currently about as far geographically as I could be from the main Batmantown-PortBotany antipodean axis of steaminess, and the weather is often too warm for a proper frock-coat, so I'm more textualist than textilish for the present. Good day all, Raven here, ex-pat Pom up here in Brisbane. Been in Aus a whole 7 months now and loving it. Greetings Marcus Julius Croft at your service. (This is a Nom de Guerre). I hail from the Queens State of Victoria, and although a Newcomer to the genre, I am setting the gears in motion. As a Steampunker, I believe in the Spirit of the Old World, an ancient ideal and hope to combine new technology with the Romantic Aesthetics of the past. Should hope to One day meet a few of you. It is smashing to be hearing from so many new good folk here in the Antipodes. I have seen some sneaky news lately about this; and I'm excited in anticipation. I am busy creating for this exhibition, thus far I have four pieces completed and one underway..
OK, enough with the secrete squirrel innuendo ... cough up with the details .... when and where is this exhibition? Honestly - I cannot say too much about it yet as there are some final grant applications pending, but all going well it will open in an Australian state capital city somewhere on the eastern sea board in November this year, show for a few months and then tour nationally for around two years. Once all is finalised we will run a thread on the show here in 'Oceania' for sure. Brisbane craft and design gallery Artisan has been awarded $51,400 of Australian Federal Government arts funding to curate and present “The Antipodean Steampunk Show“, a large-scale exhibition featuring “objects, photography, fashion, footwear, illustration, jewellery, sculpture and film”. The exhibition will benefit from a partnership with the Queensland Maritime Museum, and the exhibition opening is planned to have a dress code and live entertainment. “The Antipodean Steampunk Show” will represent some 20 exhibitors with 2-3 works each (depending on scale). Some confirmed exhibitors include: Cliff Overton (Mad Uncle Cliff) – weapons, sculptural objects; Alex Chambers - costume; Kate O’ Brien - photography; Pendragon – footwear; Urbandon – jewellery; Filip Sawczuk – lighting and sculpture; Caleb Heinselman – electronics (CD player); Steelhips (Michelle Murray) – jewellery. The exhibition is still looking for artists, and would love to see examples of work “with technology or furniture”. The exhibition will open at artisan 25 Oct – 22 Dec 2012, and will be toured to 11 regional galleries across 4 states from 2013 to early 2015. Sounds exciting, when, Mad Uncle, is it comming to Melbourne? The exhibition is still looking for artists, and would love to see examples of work “with technology or furniture”. I shall contact the gallery and see if they want a Brass Gogglesthread started on the show. Curse my forgetfulness, I thought I posted in this thread an age ago! In any case, I'm Bree and I live in Melbourne. Have been steampunk forever, but only discovered it as an official society a few months back. Hope to have the pleasure of meeting a few of you fine folk someday. Lovely to have you on board. Semaphore signals articulating the method of secret geetings for our society will be issued via balloon over Melbourne shortly. I use my Dad's old telegraph dynamos. Hi all, I'm the new guy Stacy, 35 year old male from Brisbane. I have an extensive art and design background with an avid interest in all things mechanical. I'm hoping to possibly establish clientele and commission work once I further adapt my skills. I've pulled my website down to give it a complete makeover but will post its whereabouts in the near future. Welcome Stacy, look forward to possibly making your acquaintance at the opening night in Brisbane. I'm in Townsville, though I can range as far as Ingham or Ayr/Home Hill in the course of my work, servicing document replicating engines. Nothing steampunk seems to happen here, save the monthly works at the TDSME Fun Park, which aren't terribly steamy as most of the locos that go there are simple replications of diesel locomotives with sheet metal bodywork in the manner of papercraft; and the occasional game of Warmahordes, and Dystopian Wars. The yearly Heritage Days at the park in front of West End cemetary offer little. I have so many things to work on at once and while I wish to make some art it doesn't happen terribly often. I have a Deviantart account under the name "thoughtengine" but right now there are only some photomanipulations and pictures of a scene I made inside a Chessex dice case. I collect trains in On30, OO9 and HOn3.5 (serious narrow gauge freak) have started building a layout in OO9 and am already planning a second one in British N (both microlayouts). My place of residence is the fair hills of rustic Adelaide, South Australia, a place bereft of other steampunkers, so I live mine on line. I was introduced to steampunk by watching a man in an amazing costume walk down the corridor at a Comic convention. An analytical engine Aether space searching took me to the Steampunk Empire Forum, where I had my misunderstandings of steampunk corrected, and fell in love with the genre. I then opened a bar there, made many firm friends, took to wearing pinstripe pants, longsleeves, vests, pocket watches, frock coats (all proud op shop finds, except the watch) and made a collection of damn fine hats. I wear these on a day to day basis, being a teacher of primary school children I can get away with this. I also took to roleplaying on-line stories, and then to attempting to write my own never to be published short stories based on my roleplay character. 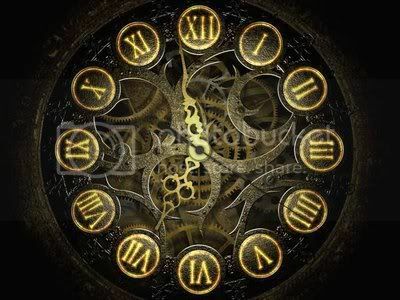 All in all, loving the creativness of steampunk, and looking forward to having a new forum full of new friends to make. Octavius von Gilgamesh, Gentleman Explorer at your service. Hailing from the steamy streets of Adelaide, a man of mystery and intrigue. Spend most of my time in the mundane, but when the time is right, and the clock strikes 13, I appear to add a touch of debonair to the situation. May the gods stand between you and harm, in all the empty places where you must walk.